• US Ag Secretary Perdue: "Don't Fear Your Food"
• Isabela Governor: "Golden Rice is a Responsible Research"
The biodiversity, which is vital for food and agriculture, is disappearing by day, according to the first-ever report of the Food and Agriculture Organization of the United Nations (FAO) on the State of the World's Biodiversity for Food and Agriculture. The report stresses that once biodiversity is lost, all the species that support the world's food systems and sustain the people who grow and/or provide our food, cannot be recovered. The report, prepared with the guidance of the Commission on Genetic Resources for Food and Agriculture, is based on the data provided by 91 countries. It was reported that there is a decreasing plant diversity in farmers' fields, an increasing number of livestock breeds at the risk of extinction, and a rising proportion of overfished fish stocks. Of the ~6,000 plant species cultivated for food, only about 200 contribute significantly to global food production, and only nine account for 66 percent of total crop production. With the alarming data presented, the report also highlights the role of the general public in reducing the pressures on biodiversity for food and agriculture. Read the report from FAO. The U.S. Department of Agriculture Foreign Agricultural Service (USDA FAS) released the Global Agricultural Information Network (GAIN) report on the agri-biotech status of South Africa. The report highlights that the production of GE corn, soybeans, and cotton in South Africa has reached 2.7 million hectares. About 94% of corn plantings, over 95% of soybean plantings, and 100% of cotton plantings are all GE seeds. Thus, the country is the largest GE crops producer in Africa, and ninth in the world. Download the report from USDA FAS. For people who suffer from celiac disease, traditional staples like wheat bread and pasta are off the menu. With celiac, the body's immune system reacts when gluten is eaten, causing nausea, cramps, malnutrition, and other health problems. There is no available treatment for the disease, other than avoiding foods made with wheat or eating an enzyme supplement with every meal. A team of scientists from Washington State University, Clemson University, and partner institutions in Chile, China, and France developed a new genotype of wheat with built‑in enzymes designed to break down the proteins that cause the body's immune reaction. The team introduced a new DNA into wheat, producing a variety that contains one gluten-busting enzyme (or glutenase) from barley and another from the bacteria Flavobacterium meningosepticum. The enzymes break down gluten proteins in the human digestive system. The scientists simulated the human body's digestive tract, tested gluten extracts from the experimental grain and found that it had far fewer levels of the disease-provoking proteins. The enzymes reduced the amount of indigestible gluten by as much as two thirds. For more details, read the WSU Insider. US Ag Secretary Perdue: "Don't Fear Your Food"
At the recent U.S. Department of Agriculture 95th Agricultural Outlook Forum held at Arlington, Virginia on February 21-22, 2019, Agriculture Secretary Sonny Perdue said, "Consumers need the truth: Don't fear your food" in his keynote speech. During the Forum, two panels discussed advances in agricultural biotechnology and the evolution of federal regulation. "We need to help inform the nonfarmer to understand that crop protection tools and these technologies help to feed the world and will be needed more in the future," said Perdue, who defended the safety record of agricultural biotechnology use in U.S. agriculture. Secretary Perdue added that despite a sterling safety record for GMO foods, misinformation becomes prevalent, leading to bad policy. The USA has been at the forefront of biotechnology research, development, and commercialization, and has been the world's top producer of biotech crops since 1996. In 2017, a total of 75 million hectares of biotech crops were planted in the USA. 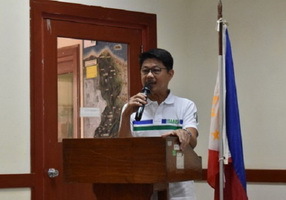 Isabela Governor: "Golden Rice is a Responsible Research"
At the public dialogue held in Isabela Province, Philippines on February 11, 2019, Governor Faustino Dy III commended the Golden Rice Project for securing all the necessary requirements first before conducting field-testing, and for initiating dialogues among researchers, policymakers, and the public. "We can see that the researchers behind the Golden Rice Project are really responsible for complying with all the requirements before they proceed to the actual field trial. Hence, let us give them the benefit of the doubt that they are doing this project for the sake of the greater number of people in our community," said Governor Dy. During the open forum, Governor Dy emphasized how research helps the national government achieve its goal of achieving food security in the country. He assured the public that the local government units of Isabela prioritize the safety of their citizens. He also encouraged farmers' groups to continue monitoring the project to ensure the security of rice consumers. An independent review of the moratorium on genetically modified (GM) crops in South Australia that has existed since 2003 has revealed that farmers have lost more than $33 million from 2004 to 2018 and would lose another $5 million over the next six years. The review, prepared by University of Adelaide agricultural economist Kym Anderson provides the government and people of South Australia with an independent assessment of the economic costs and benefits of maintaining, modifying or removing the South Australian moratorium (which is currently scheduled to continue until 2025) on the production or transport of GM crops. The report contains 19 findings and the South Australian Government said that a majority of the written submissions favor the complete removal of the moratorium on GM crops. Another key finding is that there was no price premium for grain from South Australia for its GM-free status and the state's farmers did not "enjoy better access" to European Union markets. The report also states that an important consequence of the ban is not the withdrawal of private R&D investment by life science companies but also less public sector funding for the state's research institutions. For more details, read the report in the Primary Industries and Regions SA website. Researchers at Martin Luther University Halle-Wittenberg (MLU) in Germany are providing new insights into basic cell division in plants. The team has now understood how processes are coordinated that are pivotal in properly separating daughter cells during cell division. The researchers examined the roots of Arabidopsis thaliana. They grew normal plants and plants in which they artificially switched off certain enzymes affecting the composition of the membranes to find out which membrane building blocks are important for cell division and why. Professor Ingo Heilmann from MLU and his research group was able to show that PI4P, a membrane building block, plays two roles during cell division: PI4P not only controls the activity of the fusion machinery, it also ensures the new material is transported in the right direction. For the first time, the researchers were able to show that PI4P helps to ensure that the protein scaffold of the phragmoplast is assembled and disassembled in the right places. In normal plants, this results in regular cells that fit together perfectly and give the plant its needed stability. In the mutated plants, however, severe defects in cell division were found. The results also show the dynamics of the plant's cytoskeleton of microtubules. The cytoskeleton not only determines the direction of cellular transport processes during cell division, but also directs general plant growth. For more details, read the press release from MLU. Sumoylation, a post-translational modification process involving small ubiquitin-like modifiers (SUMOs), play a vital part in higher plants' responses to stress. However, the mechanisms underlying the involvement of Sumoylation in stress responses are yet to be explored. Scientists from Henan Agricultural University in China conducted a study to investigate the effect of SUMO conjugating enzyme gene in salt and drought tolerance. The results are published in Plant Science. The researchers isolated and analyzed a putative SUMO conjugating enzyme ortholog from maize (ZmSCE1e). Analyses showed that ZmSCE1e contains a central active domain similar to known SCE1 proteins, but is the cereal-specific isoform. They also over-expressed ZmSCE1e in tobacco plants, which led to increased levels of SUMO conjugates and improved their tolerances to salt and drought stresses. Amplification techniques showed that stress defense genes were significantly boosted in the ZmSCE1e-transgenic plants. The results may contribute in accelerating genetic improvement of crop plants with tolerance to environmental stresses. Read the research article in Plant Science. Groundcherry, also known as husk cherry, is a small, yellow, and highly nutritious edible fruit with a papery husk. The fruit could be the next superfood, but some of its undesirable characteristics, such as its growing habit and extensive fruit drop, must be improved. Thus, scientists from the Boyce Thompson Institute and Cornell University developed a new plant regeneration and transformation method that can be used to improve groundcherries. The results are published in the Journal of Plant Biotechnology. Cotyledon and hypocotyl explants were tested for plant regeneration but only the hypocotyl explants successfully regenerated shoots. For transformation, the hypocotyl explants were infected with A. tumefaciens containing a binary vector with a reporter gene and selectable marker gene (nptII). After cocultivation, the explants were cultured on plant regeneration medium and a DNA amplification technique showed the medium (200mg/L kanamycin) with the highest transformation efficiency. According to the authors, their study is the first conduct of A. tumefaciens-mediated transformation in groundcherry. The findings can help achieve the groundcherry's full potential for future agricultural production. Read more results in the Journal of Plant Biotechnology. Improving the lignins in plant's biomass is vital in enhancing the biorefinery process due to lignin's ability to increase biomass heating value and represent a potent source of valuable aromatic chemicals. 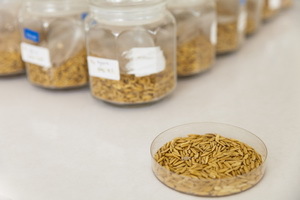 However, limited information is available for effective molecular breeding techniques to improve lignin production in grass species such as rice, which is a model grass species. Kyoto University scientists explored using CRISPR-Cas9 to develop lignin-enriched transgenic rice. Their findings are published in The Plant Journal. The researchers generated transgenic rice with improved lignin content via targeted mutagenesis of the transcriptional repressor OsMYB108 using CRISPR-Cas9 mediated genome editing. The OsMYB108-knockout rice mutants exhibited enhanced expressions of lignin biosynthetic genes and improved lignin deposition in culm cell walls. Further analyses showed that the mutant cell walls had high levels of γ-p-coumaroylated and tricin lignin units, which are vital components of grass lignins. The analyses also showed that the relative abundances of major lignin linkage types were modified in the rice mutants. Conventional plant breeding using the backcrossing technique can be laborious, expensive, and imprecise. In addition to time and cost limitations, it does not allow transfer of genes between species which are genetically distantly related and sexually incompatible. 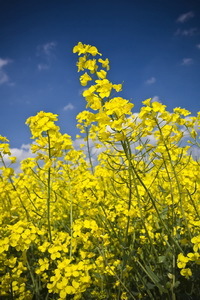 With the advances in modern technology, new plant breeding techniques have emerged which not only allow transfer of genes from unrelated species to produce genetically modified organisms (GMOs) but also allow precise and predictable genetic modifications, avoiding the cost and complications associated with sorting through a myriad of genes in conventional plant breeding. In SEARCA Biotechnology Information Center's (SEARCA BIC) fourth Policy Brief, Dr. Emil Q. Javier, a member of the National Academy of Science and Technology (NAST) and Chair of the Coalition for Agriculture Modernization in the Philippines, Inc. (CAMP), expounds on the CRISPR-Cas9 System, a novel genetic technique which has wide applications in plant and animal breeding as well as in drug development and human gene therapy. CRISPR, which stands for Clustered Regularly Interspaced Short Palindromic Repeats, is a natural immune defense system found in lower forms of organisms like bacteria and has been tweaked to work in higher plants and animals including man as a precise, relatively quick and affordable method of genome editing. The 2018 Policy Brief series is produced in partnership with the International Service for the Acquisition of Agri-biotech Applications (ISAAA), Coalition for Agriculture Modernization in the Philippines (CAMP), Department of Agriculture-Biotechnology Program Office (DA-BPO), Program for Biosafety Systems (PBS), and DA-Bureau of Agricultural Research (DA-BAR). For more details, read the full policy brief. A large family of genes in rice are responsible for the production of small ubiquitin-like modifiers (SUMOs), which are vital in responding to various environmental cues. In a previous study, it was demonstrated that the OsOTC class of SUMO proteases has a critical role in salt and drought stress through gene silencing or RNA interference. However, finding out the role of each family member is not possible with RNAi. Thus, Ari Sadanandom from Durham University and colleagues conducted another study using the CRISPR-Cas9 system for targeted mutagenesis of OsOTS1 in rice cultivar Kitaake. Results showed that guided RNA mediated mutation in OsOTS1 was very effective with ~95% of the transgenic plants exhibiting the desired effect without off-target mutations observed. Furthermore, the mutations were heritable in the subsequent generations. OsOTS1 CRISPR lines showed improved sensitivity to salt with reduced root and shoot biomass indicating that OsOTS1 has a major role in salt stress tolerance in rice. The results imply that precise and effective genome editing can be used to characterize the SUMO system in rice. Read more results from BioRxiv. 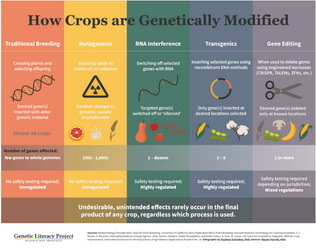 Genetic Literary Project released a page of infographics showing How Crops are Genetically Modified. 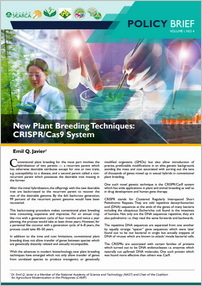 Various forms of breeding were compared, including traditional, mutagenesis, gene silencing, genetic engineering, and gene editing, in terms of how many genes are altered in the process and which require safety tests. It was highlighted in text that "Undesirable, unintended effects rarely occur in the final product of any crop, regardless which process is used." Download the infographics from GLP. ISAAA blog series 5 Questions With... features renowned cotton scientist Dr. C.D. Mayee, the farmer's son who became India's champion of biotech. In the feature, Dr. Mayee talked about growing up in his father's farm in Sakharkherda, his aspiration to study agriculture, and how he was able to be admitted to the famous Indian Agricultural Research Institute (IARI). After the success of Bt cotton in his country, Dr. Mayee believes that smallholder farmers in India need similar technologies to further enhance their incomes and that biotech will address productivity constraints. For the critics of biotechnology, Dr. Mayee said, "Other people speak about the technology, but what do they know? As a farmer's son, I have faith in our farmers and know that what they say is true." For more about Dr. Mayee, read the feature in the ISAAA Blog.